My natural hair color is a medium brown. Recently I dyed my hair a deep raven black. It’s so black, it almost have a blue cast to it. I love it. Do you have an idea for a cool, edgy long hair bun or updo? My hair is also long and extends to the middle of my back. I’ve been invited to a dressy party and have picked out a gorgeous deep blue (a cross between turquoise and dark cornflower) long gown. I want to wear my long hair up, but I also want to show off the color a little bit. 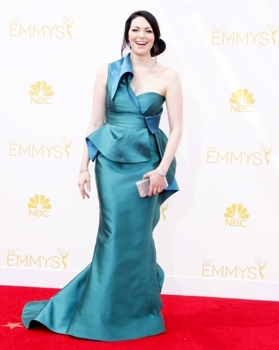 Actress Laura Prepon appeared on the Red Carpet at the 2014 Emmy Awards in a gorgeous long turquoise hued Gustavo Cadile gown. The gown looked amazing against her long jet black hair which was wrapped into a long hair bun nestled against one side of her stunning head. You might wish to take Laura’s example and consider wearing a side or back bun which will work great for your long hair, show off your gorgeous new hue and create a cool edge. 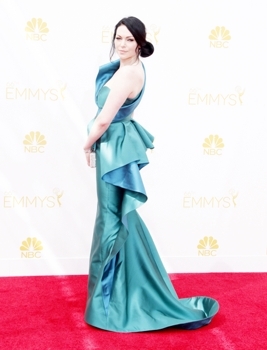 The beauty of Laura Prepon’s long hair bun is that it’s not overly formal, fussy or tight. You can position a similar long hair bun on either side of your head, near the nape of your neck or even higher up near the crown. 1. Wet wash detangled hair in lukewarm water with desired cleansing formula (shampoo, diluted, conditioner only, water, combo). 2. Rinse well. Apply a rinse-out conditioner if appropriate for your hair’s length, type, texture and current condition. 3. Separate hair into 2″ sections and detangle from the ends to the roots using fingers or a wide tooth comb. 4. After hair is completely detangled, rinse well and finish with a cool or cold water rinse. 5. Towel blot. Apply a styling colocktail which includes a volumizing mousse. For extra volume apply a volume spray to roots. 6. Blow-dry hair bone straight with a blow dryer and boar’s head round or paddle brush. 7. Part hair into a straight center or deep side part depending upon the direction of your natural hair growth. 9. Using fingers or a boar bristle brush, direct all of the hair to one side of your head and pull it into a ponytail secured with a hair friendly elastic band. Position the ponytail either in front or behind your ear. 10. Starting at the top of the pony, start twisting the entire tail in either a clockwise or counterclockwise direction to form a type of hair rope. 11. Keep twisting until the hair rope starts to twist over upon itself. 12. Take the twisted hair rope twisting around the base of the pony until all of the hair is wrapped to create a knotted bun. Use fingers to create the desired profile. If you prefer, you can braid your hair instead of twisting it and coil the braid around the pony base. 13. Secure the long hair bun into place with bobby pins. 14. To prevent flyaway hair and frizz, rub a small amount of gel or finishing cream onto the palms of your hands. Massage together. Lightly swipe the palms of your hands over the top of the hair. Optionally, if you desire a high-gloss finish, spray about 3-5 pumps of a shine spray onto the palms of the hands. Massage together. Gloss lightly over the top of the hair. One Response to "Long Hair Bun"